The USB accessory sits below the display and is held in place with magnets. Sure, the new MacBook Pro has that fancy Touch Bar, but some Apple laptop owners long for a machine with a full touchscreen display. A company called AirBar already gave the PC faithful a USB accessory that gives a 15.6-inch screen a more tactile function, and at CES it's doing the same for the 13.3-inch MacBook Air. The company calls the device "plug-and-touch," which means you don't have to worry about futzing with drivers before you can use the gadget. The installation process involves putting a couple magnets on the laptop to hold the AirBar in place. Once that's done, all you have to do it plug it into a USB port, and the device emits a light field over the display to pick up you touch navigation, pinch-to-zoom and scrolling gestures. Of course, you'll have to remove it to completely close your laptop, but the addition of touch with a relatively painless install makes a solid case for the add-on. 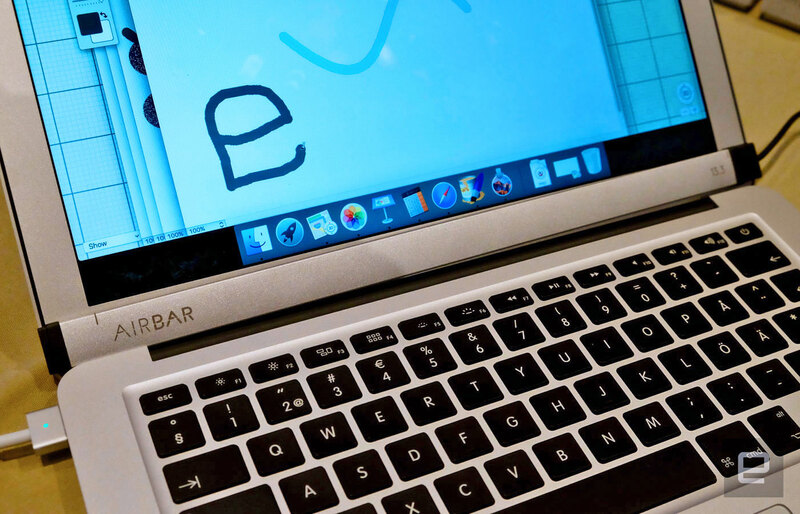 I tried the AirBar on a MacBook Air here at CES and it performed well navigating around Google Maps and Paintbrush on OS X. Unfortunately, the unit on display is a working prototype so I wasn't able to test zoom and scrolling functionality. The company says you can also use a physical object to handle input -- something like a stylus or even a paintbrush. Right now, there's only the one size for one Apple laptop, but the plan is to expand the line with more sizes that accommodate more computers. If you're looking to outfit your 13-inch MacBook Air with an AirBar, you'll be able to do so in March. The accessory will be available on Amazon at that time for $99 -- a $30 premium over the existing PC version. Nathan Ingraham contributed to this report.